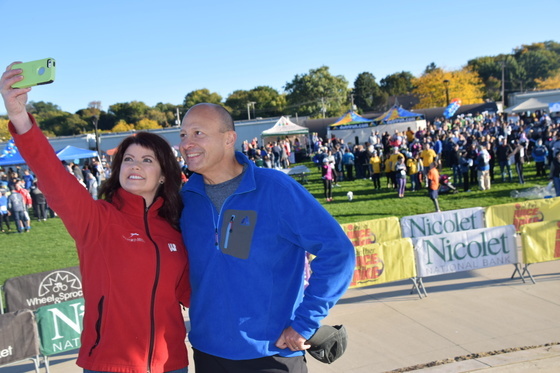 You can see I'm trying to raise my phone up to include all the runners in the background of this selfie. The guy I'm with is the reason I was at this Saturday morning run...and one of the reasons I am alive today. This man, Dr. Kirk Ludwig, is my surgeon, who had the challenge of cutting the cancer out of my guts 6 years ago. I know its sounds gross; that's why I don't miss an opportunity to sing this man's praises. So when he asked me to support the well-named “Get Your Rear in Gear 5K,” a run/walk to support colon cancer research, of course I said "yes". 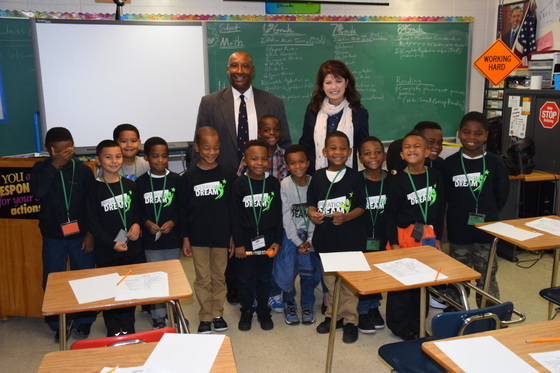 We then drove to Operation Dream, which the state is supporting with a grant to help young men from the inner city learn financial management and entrepreneurship. From there we hit Precision Plus to celebrate National Manufacturing Day – they are aptly named because I’m actually holding a mortar pin in my fingers in this picture...it looked like it belonged in a doll house! Since the Governor was on the road, I ran the Cabinet meeting that morning. 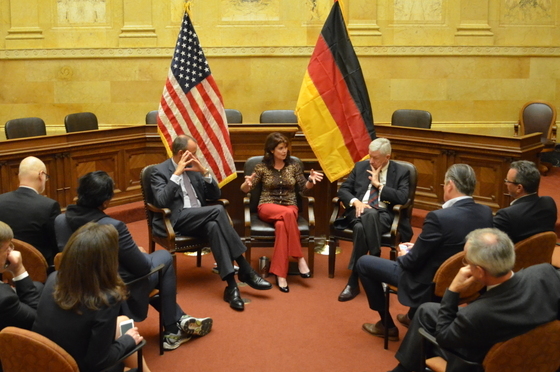 From there I led a discussion with German ministers and parliamentarians who are visiting Wisconsin to see a battleground state in action a few weeks before a national election. Thanks to my friend, former Congressman Tom Petri for showing our distinguished guests signature Wisconsin hospitality! From there I headed to Germantown to help Graphics System Corp. (GSC) move in to 20,000 feet of new space. They grew their staff by 27% last year and their CEO is hoping that Wisconsin will continue as a business friendly state so they can keep up the momentum and fill their new space with new people serving new customers. Tuesday started in Hartford talking exports with small and medium-sized companies; you know how strongly I believe in diversifying our customer base to keep our economy on a firm footing whatever the global trends. From there we headed to Kessler’s Diamond Center in Germantown (I can't stay away!) to celebrate Employee Ownership Month – when employees own a company, they will never vote to ship their own jobs overseas! Employee owners are also quite astute managers, well-informed workers and form great collaborative leadership teams. I think ESOPS (Employee Stock Option Plans) are super contributors to the stability of Wisconsin's economy. Next-- on to Appleton to discuss growing our state’s financial services industry, then Manitowoc for the ground breaking on the new Wisconsin Agriculture Education Center. When finished, the WAEC will be great for educating our next generation of Wisconsinites about the farm-to-table movement in food production and a major ag-tourism attraction. I answered questions and listened to suggestions at a roundtable with the Manufacturing Diversity Institute, which is made up of manufacturers of diverse ethnic descent. You know my passion for manufacturing, which represents about 19% of our Gross State Product, and these employers are building wealth in neighborhoods and communities that need long-term prosperity. I also was preparing to send a letter to our UN Ambassador. As the Chairman of the Republican Lieutenant Governors Association, you'll remember I led a group of Lt Govs to Israel earlier this year. UNESCO, the United Nations' "heritage and history" arm, had a resolution that essentially declared that Jerusalem was historically significant to only the Muslim faith. Because both Jews and Christians consider this site to be the most significant in their own faiths, I obviously had a problem with UNESCO's denial of facts. My colleagues joined me in my plea, signing the letter urging recognition of all the monotheistic religions that hold Jerusalem dear but the UN saw things through a different lens. After lunch with my friend Scott Neitzel, our Secretary of Administration, I drove over to the UW Carbone Cancer Center to join with a number of colon cancer advocates on a research tour. I shared some of my story as a survivor and applauded the amazing research UW is conducting to find a cure to this ugly, awful disease. It’s mid-morning Friday, and I’m writing you from the back of the car as we leave another event. We all know the old joke about two seasons in Wisconsin: winter and road construction. I’ve been living it as they’ve redone Highway 67 here in Oconomowoc. That project finished today, and I’m sure my neighbors will be very happy with the new roads free from orange barrels. You might say I’m ready for a weekend, but as soon as the official duties end, my mom job begins. This weekend Ella has closes on Saturday night playing young Violet in VIOLET at the Skylight in Milwaukee. Seeing her on stage reminds me why I do what I do the rest of the week – I know politicians say it all the time, but for me it’s true. I ran for this office, and I run across Wisconsin every week, because I want to leave this state as prosperous as possible for my girls to live their American dream some day. Thanks for reading!